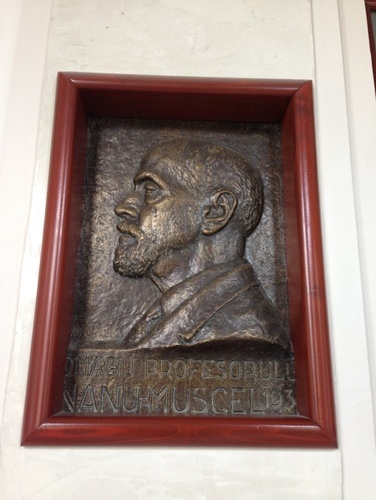 Ion Nanu Muscel studied in Paris where he obtained the bronze medal of Public Medical Assistance in 1891. After his Ph D, he returned to Romania where he worked in several hospitals and, in 1919, became Head of the first medical clinic in Coltea Hospital, Bucharest. He was a bright clinician and school creator. In 1919, he co-founded the "Medical Society of Hospitals" in Romania and became its first President. In one of his treaties, "Fasciculus of symptoms", he stated that "clinical skill is nothing but well gathered and well classified observation". The clinic published under his supervision studies on: pneumonias, multi-locular pleurisy, endocarditis, sphincter of Oddi. The house he lived in while staying and working in Bucharest can be seen in Piazza Romana no 7, Bucharest, Romania.